Look! Up In the Sky! It’s the 24th Annual Eureka Springs Kite Fest! The only things not up in the air about the 2014 Eureka Springs Kite Fest are the date and location: March 22nd at the Turpentine Creek Wildlife Refuge. That’s right, the 24th annual arrival of this fantastic event is right on schedule – it just wouldn’t be spring in Arkansas without it! So … what is the Eureka Springs Kite Fest, exactly? The Eureka Springs Kite Fest – “Art With An Altitude” – is a celebration of everything kite. 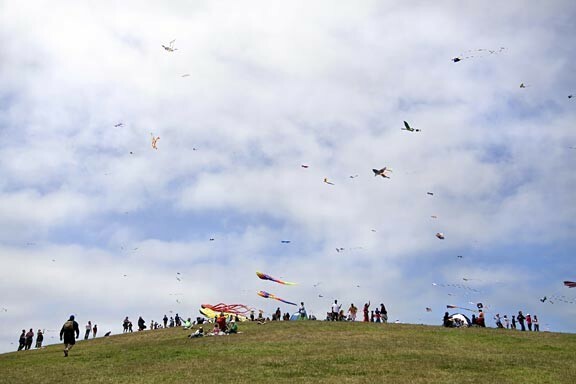 Attendees are encouraged to bring their own kites, buy or make one at the festival, or simply sit back and watch the wide array of kites as they soar overhead on the March breezes. And oh, what kites! Sure, you’ll see plenty of the run-of-the-mill kites we all picture when we hear the word but that’s not all – oh, no! You’ll see kites of all shapes and sizes at the Eureka Springs Kite Fest – box kites, fighting kites, experimental kites, professional kites, kites shaped like animals, kites shaped like things, kites that are works of art, kites worth thousands of dollars and, if you like, even a kite hand-made by you! Yes, sponsor of the Eureka Springs Kite Fest is Kaleidokites and they will be on hand to not only show you various flying techniques but also how to make your own kites. There will also be vendors, food, contests, and activities for people of all ages. Proceeds from the event go towards rescuing large animals and the ongoing care for over 135 tigers, lions, cougars, and other wildlife that make Turpentine Creek Wildlife Refuge their life-long home. The annual Eureka Springs Kite Fest is one of Turpentine Creek’s most popular events and those attending are encouraged to tour the wildlife refuge as well as enjoying the festival. Admission to the Eureka Springs Kite Fest is free while tours of Turpentine Creek Wildlife Refuge during the festival will be charged at their regular rate.